LOS ANGELES (AP) — In the first penalty of its kind, federal transportation officials on Tuesday docked Asiana Airlines $500,000 for failing to promptly contact passengers' families and keep them informed about their loved ones after a deadly crash last year at San Francisco International airport. The U.S. Department of Transportation said it took the South Korean airline five days to contact the families of all 291 passengers. In addition, a required crash hotline was initially routed to an automated reservations line. Never before has the department concluded that an airline broke U.S. laws requiring prompt and generous assistance to the loved ones of crash victims. Three people died and dozens were injured on July 6 when Asiana Flight 214 clipped a seawall while landing. One of the victims, a 16-year-old girl, apparently survived being ejected onto the tarmac, only to be run over by a fire truck in the post-crash confusion. Under a consent order the airline signed with the department, Asiana will pay a $400,000 fine and get a $100,000 credit for sponsoring industry-wide conferences and training sessions through 2015 to discuss lessons learned from the situation. In a statement emailed to The Associated Press, Asiana spokeswoman Hyomin Lee said the airline "provided extensive support to the passengers and their families following the accident and will continue to do so." Asiana said in the consent order that its response immediately after the crash was slowed because it occurred on a holiday weekend when staffing was short. The airline also said it was not alone among foreign airlines with "few trained employees to attend to post-accident responsibilities," and it noted that it had assigned a special representative to each passenger and family within a few days of the crash; flown in family members from overseas; and provided professional crisis counseling through the Red Cross. — Asiana generally "failed to commit sufficient resources to carry out its family assistance plan," and it wasn't until five days after the crash that its employees took over all of the carrier's responsibilities under U.S. law. In addition, the airline lacked translators and personnel trained in crash response. — It took Asiana more than 18 hours to staff a reliable toll-free number for family members to call. — The law requires family notification as soon as practical, but Asiana had contacted just three-quarters of families within two days. In the late 1990s, after airlines were roundly criticized for ignoring desperate requests for information after crashes, Congress required carriers to dedicate significant resources to families of passengers. Last fall, the AP reviewed plans filed by two dozen foreign airlines and found cases in which carriers had not updated their family assistance plans as required. Since AP's story, several airlines have updated family assistance plans with the Department of Transportation. Among them is Asiana's bigger rival, Korean Air. Many airlines invest in crash preparedness and family assistance planning, but a minority are "using lip service and euphemisms in their plans," said Robert A. Jensen, whose company has contracts with hundreds of airlines to help after an accident. "It's time that some of the airlines that have been flying under the radar be held accountable," said Jensen, CEO of Kenyon International Emergency Services. "Somebody finally got caught." Family members of some passengers have sued the airline, alleging coach passengers suffered more serious injuries than business class travelers because of different seatbelt configurations. 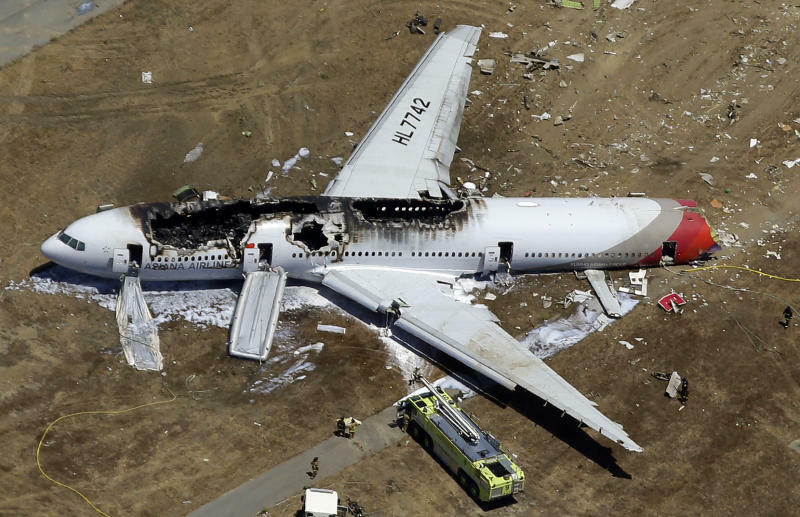 Lawsuits also claim that Asiana failed to properly train its pilots and that the plane's auto-throttle was inadequate.